The bat ray is named for the wide, angular shape of its pectoral disc, with trailing ‘wing’ tips and dark brown to black coloring on top. It has a whip-like tail twice the length of its body, with a venomous spine at the base, and distinctly protruding head and large eyes. It prefers living in shallow sandy or muddy bays or kelp forests, and comes closer in to shore at night to hunt crustaceans, mollusks, and small bony fish. Larger sharks generally prey on rays. 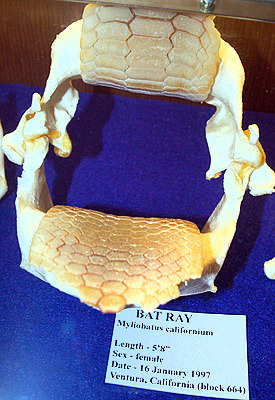 The common names for Myliobatis californica throughout English-speaking countries is the bat ray and the bat ray due to pectoral fins that resemble bat wings. Other names include aigle de mer técolette (French), Californische adelaarsrog (Dutch), raya gavilán (Spanish), raya murciélago (Spanish), and tecolote (Spanish). Bat rays readily adapt to captivity and are commonly displayed at public aquarium facilities. 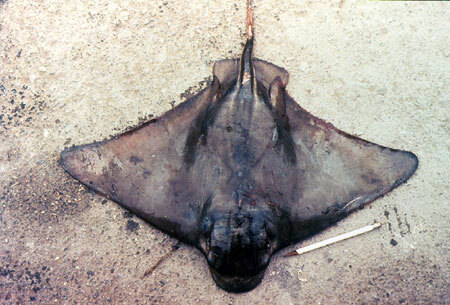 Bat rays are sometimes targeted by sport fishers on heavy tackle with shrimp, clams, or crabs as bait. Although there is no commercial fishery for this species, it is considered a threat to oyster growers. As a result, oyster growers have been trapping bat rays for many years to avoid heavy profit losses. As a non-aggressive marine animal, the bat ray poses little threat to humans. However, care should be taken when handling these fish due to the venomous spine that is located at the base of the tail. > Check the status of the bat ray at the IUCN website. 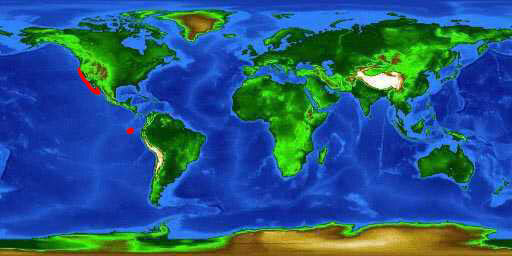 The distribution of the bat ray is limited to the eastern Pacific Ocean from Oregon (USA) south to the Gulf of California and also near the Galapagos Islands (Ecuador). 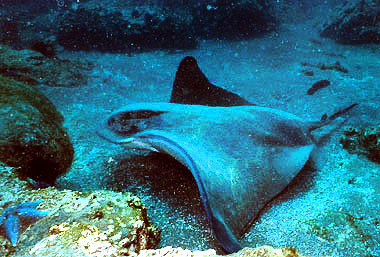 This ray is found in muddy and sandy bottom bays, rocky bottoms, and kelp forests. Primarily a resident of shallow waters, the bat ray can be found at depths ranging from 1-46 m either singly or in large schools with members of their own species or species of eagle rays. It has been hypothesized that diel movement patterns of the bat ray toward warmer inshore water during cooler times of the day and out to cooler deeper water during warmer hours may be attributed to behavioral thermoregulation. 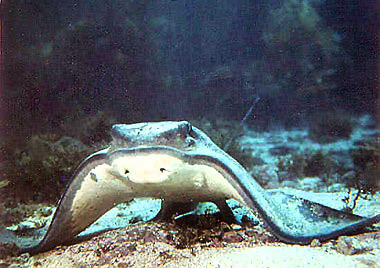 The bat ray has been reported to jump out of the water and to skim along the surface for extended periods of time. Bat rays have a flat body with a distinct protruding head, large eyes, and smooth skin. The whip-like tail is as long or longer than the body width with a dorsal fin at the base and armed with a barb-like spine located just behind the body. This ray is commonly referred to as bat ray, named for its long pectoral fins that resemble bat wings. The bat ray is easily distinguished from manta rays by the lack of the arm-like cephalic fins that manta rays have on either side of their heads. The bat ray has smooth skin which is dark brown or black in color, changing to white on the underside with no other distinct markings. Dentition of the bat ray consists of a single elongated medial file and three lateral files of teeth on either side. The lower tooth plate is flat while the upper plate is convex in shape. The teeth are hexagonal, arranged in non-termino-lateral positions. These plates are used for crushing and grinding prey. The maximum disc width reported for the bat ray is 6 feet (180 cm) with a maximum weight of close to 200 pounds (91 kg). At birth, young bat rays have a disc width of approximately 1 foot (.3 m). Typically, females grow larger than males, reaching weights of up to 200 pounds (91 kg). Bat rays are known to live at least 23 years. Males reach maturity at disc widths of approximately 26 inches (67-68 cm) and weights of 10 pounds (5 kg) while females mature at larger widths than males and weights of at least 50 pounds (23 kg). Age of maturity varies between 5 and 6 years for females and 2 years for males. 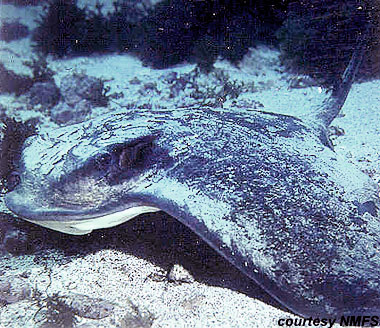 The bat ray feeds on bivalves, polychaetes, shrimps, and crabs as well as small bony fishes. A study carried out in Humboldt Bay, California examined stomach contents of over 500 bat rays with clams being the dominant prey item. This study also indicated food habits of bat rays change with increase in size with a larger variety of prey as well as larger prey items consumed by rays with increasing size. This ray uses its snout to dig invertebrates from sandy bottoms. It also captures food by waving its pectoral fins rapidly to move sand, exposing hidden prey items. Mollusks are first crushed by the bat ray, the shells spit out and the soft body tissues eaten. Small fish that would otherwise not be able to access the buried prey quickly consumes left over food particles. Mating occurs in the spring or summer resulting in birth the following spring or summer. The male finds a suitable mate, swimming close behind the female with his back touching her underside. There may be repeated attempts at inserting a clasper into her cloaca until success is reached. During copulation, the pair swims together, moving their pectoral fins in unison. More than one male may pursue a female, resulting in fights among the males. Female bat rays form large mating aggregations, blocking females that are immature or that have already mated. Following a gestation period of 8-12 months, the female enters shallow waters to give birth. The litter size is highly dependent upon the size of the mother, ranging from 2-12 pups. At birth, the pups are 12-14″ inches (30-36 cm) width and each weigh about 2 pounds (1 kg). Each pup is born tail-first with their pectoral fins rolled over the body. Sharks including the white shark (Carcharodon carcharias) and sevengill shark (Notorynchus cepedianus), feed on bat rays. Sea lions consume immature bat rays. The bat ray was described in 1865 as Myliobatis californica by Gill. Gill also referred to this species as Myliobatis californicus and it may have also been referred to as Rhinoptera encenadae Smith 1886.